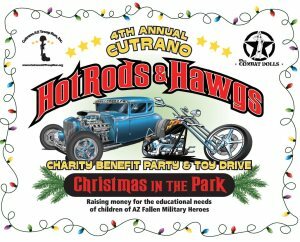 Cutrano AZ Troop Run, Inc. will be hosting their 4th Annual Hot Rods & Hawgs Charity Benefit Party and Toy Drive on Sunday, December 18, 1016 from Noon – 6:00 PM. You will not want to miss this amazing car/bike/truck & other miscellaneous vehicle show. Prizes will be awarded for multiple classes. The Combat Dolls will be joining in the fun and will be available for pictures throughout the day! This event is a family friendly event that will be spread out across 6 baseball fields with live music, kids zone, visit from Santa, raffles, vendors, Christmas Pageant hosted by The Combat Dolls and much more. If you have a car, bike, truck or any other type of vehicle you would like to enter in the show, we would love to have you! There will be a collection box for NEW unwrapped toys that will be donated to underprivileged children in the community for Christmas. Donations of school supplies and backpacks are always welcome also. Cutrano AZ Troop Run, Inc. is a 501(c)(3) nonprofit organization, founded in 2013, that provides educational funding to the children of Arizona’s fallen Military Heroes. We pay for extra-curricular activities such as dance, karate, sports, music lessons and school supplies for the children. All funding comes from the community via fundraising events and corporate grants. We hold 2 major fundraising events each year, one being a Motorcycle Run in the spring and the other a Car/Bike Show at the end of the year. Throughout the year we donate school supplies to local schools that get distributed to children in need. We are supported and sponsored by many amazing organizations such as Financial Security Group of AZ, Chuck Franklin Law, Kidz-R-Kool Pediatric Dentistry, National Automotive Repair, Keene Auto Glass, Premier Graphics, Arizona Biker Information Guide, Becker Boards, Two Gals Events and Victory Lane Sports Park just to name a few.